Riding a Vespa is a state of mind, it’s authentic and it is freedom. Our tours are especially designed to give you an aperçu of the city. You will enjoy and discover hidden places most of "madrileños" don't know. You will also get to taste some of the best tapas while maintaining the highest standards of security. You can choose in between the following experiences. Private tours with guide and tapas: City tour with private driver & guide + tapas: if you just want to chill while our guide drives you through the best sites and hidden places of Madrid this option is for you. 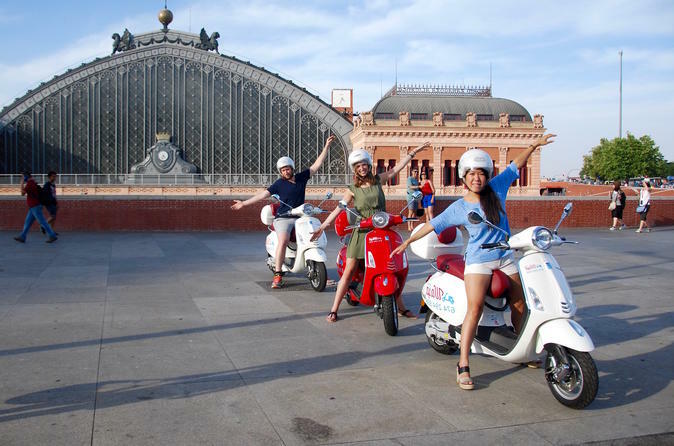 Self drive city tour with private guide + tapas: drive your Vespa and let our guide show you the the best sites and hidden places of Madrid. Private tours with GPS: Ride your own Vespa and enjoy our pre-programmed tours or just go wherever you desire.Private city tour with GPS, ½ day.Private city tour with GPS, 1 full day.